Contractor: Self installed with assistance from TT Maintenance & Contracting. 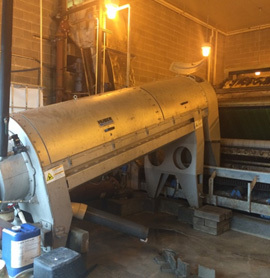 In 2014 South Dearborn Regional Sewer District (SDRSD) struggled with an unreliable sludge dewatering centrifuge that was out of service more days than it was in service. 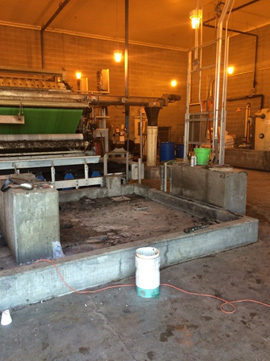 SDRSD had previously piloted Huber’s RoS3Q sludge dewatering screw press. After a major centrifuge bearing failure SDRSD used emergency funding to procure Huber’s RoS3Q 620 screw press. Huber stocks their screw press units in Huntersville, NC and was able to supply the screw press within 2 weeks of receipt of PO. The custom built control panel followed 8 weeks later. Huber received the PO from SDRSD on 10/24/14 and the unit was completely operational on 3/23/15. TT Maintenance & Contracting removed the old equipment, made concrete modifications, and placed the new Huber screw press, polymer system, and control panel. SDRSD staff installed and modified the water supply, polymer piping, installed conduit and wiring, performed electrical checks, and modified the auxiliary sludge pump control panel. The press typically runs 48-60 hours per week. SDRSD has an operator oversee the startup and shutdown of the unit each day, totaling 20-30 minutes per day. The result is about 2 hours of oversight per 60 hours of run time. Huber’s screw press has also exceeded the performance of the previous centrifuge. The centrifuge typically achieved 12-14% dry solids. Huber’s press running at 50 GPM is consistently achieving 18-19% dry solids. This increase in dry solids has reduced the number of trucks to the landfill each month from 23 to 13. 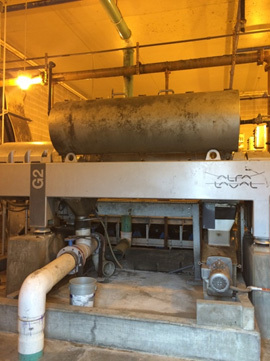 SDRSD’s decision to upgrade their solids handling system has allowed them to extend run times, increase performance, reduce maintenance costs, and reduce hauling costs.